LEXAPANEL™ STANDING SEAM sheet system gives architects and builders exceptional flexibility to create sustainable and beautiful translucent roofing and other glazing elements. 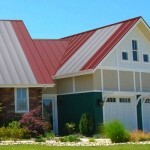 Compared with other standing seam solutions, it provides customers with far more glazing options, including a custom width optimized to their load requirements as well as a choice of thickness, coating, color, structure and type of connection. What’s more, LEXAPANEL sheet delivers the strength, weatherability, clarity and thermal insulation of SABIC’s renowned LEXAN™ multiwall sheet.